Study after study shows that birth order plays a huge role in developing one’s personality. Each birth order position has a unique set of characteristics. This lesson engages every student in the class because everyone has a birth order position they can speak about and relate to. Incorporated into this lesson is also an optional activity that will give you a great bulletin board or showcase display that will have your whole school or other classes interested in what you are doing. 11.4.12 A Analyze current research on existing theories in child development and its impact on parenting (e.g., Piaget, Erikson and prior findings versus new brain development research). Show students the power point slides of famous people and ask the same question for each slide: “What do these people have in common?” You may get some interesting answers but the one you are looking for is that the people/characters on each slide all share the same birth order position. Survey students to find out what birth order position they are and group them accordingly. Give each group a large piece of paper and ask them to generate a list of pros/cons to being in that position of their family. Encourage them to think about parental expectations, rules, chores, discipline and treatment of siblings when generating this list. Have birth order groups share their pros/cons to their positions so the class can see the similarities and/or differences to them in relation to their own positions. To learn more about the characteristics/traits associated with each birth order position, have students research them and complete a graphic organizer. Students are to use all three of the provided resources: a website, a newsletter and the textbook ( I use Child Development Early Stages Through Age 12). Once the graphic organizer is complete, view the following video clip to learn more about the impact of birth order on your life and complete the review and writing assessment activities. Optional Bulletin Board/Show Case Project: In birth order groups, have students trace a template of a person/body (the art department at my school assisted with this) on a large piece of poster board and title it with your birth order position. Inside the person/body creatively write the characteristics and traits that coincide with that position (like a hand made WORDLE). Survey the faculty/staff at your school to find out their birth order positions and write their names on a grid like chart and on colorful post-it-notes. Pass out the grid/chart to students and have them guess the position of each faculty/staff member and have them take their assigned post-it-notes and place on the correct poster (around the body). Go over correct answers and move any post-it-notes that are incorrect. Hang on the bulletin board or place in a hallway show case for the whole school to see. 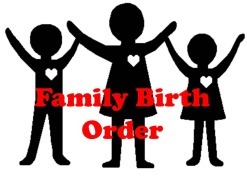 I started the year off with the families unit and one of the topics I have had a problem with is birth order. I made a template out of butcher paper and had the students group according to birth order. I then split the groups so there were only 4 to a group. I offered them some simple decorations yarn, buttons, left over scrapbook paper, construction paper etc. they had a great time and the results were fantastic. Each group was assigned a color that had to be on their person. It took us 3 days, 45 minute periods.